It may be hard to imagine, but the truth remains many football players actually come from very humble beginnings. 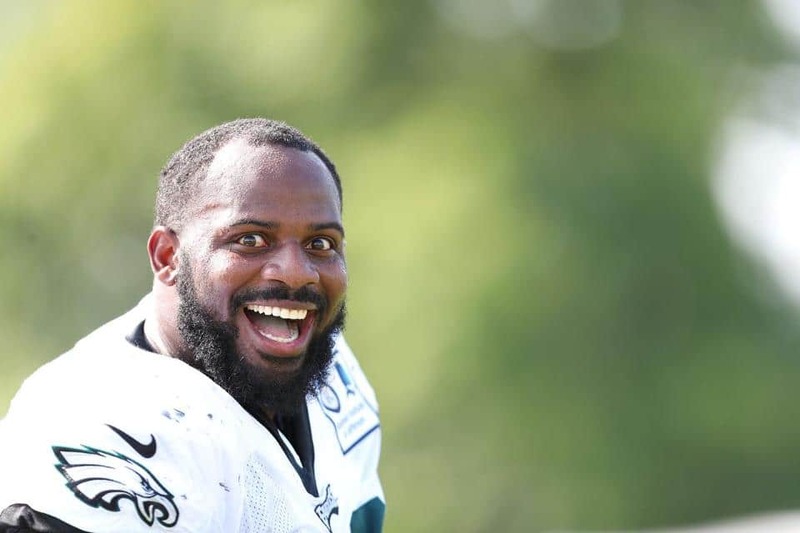 Fletcher Cox, no doubt, leads a comfortable life right now, nevertheless, he absolutely remembers where he started out from, how his mother toiled to give him a better life and helped him achieve his dreams of becoming a footballer. Today, Cox has made his family and community very proud, having recorded massive success on the football pitch and lots more. Read through to know more about the rags-to-riches story of the football player and how his career has been faring. Fletcher Cox is a professional football player who represents the Philadelphia Eagles in the National Football League (NFL) as a defensive tackle. He is the son of Malissa Cox Bright, who is also the mother of Fletcher’s three other siblings. She gave birth to the NFL star on 13th December 1990 in Yazoo City, Mississippi. Raised by a single parent, Cox grew up along with his mom and siblings in a three-bedroom trailer. Since his father wasn’t in the picture, his older brother, Shaddrick Cox, became a father figure as well as a positive male influence. Now late, Shaddrick was behind the brain behind the success of Fletcher’s career. He would always encourage him to work hard in order to get a good job and leave Yazoo City. Unfortunately, the footballer lost his brother in January 2015 at the age of 34 after he suffered a fatal heart attack. Apart from his big brother, the defensive tackle has also suffered two other major losses in his lifetime. One is the death of his best friend (Melvin Baker) who died in a car crash and the other is that of his grandmother, Jimmie Lee Cox. Fletcher Cox had his high school education at Yazoo City High School in Yazoo City, Mississippi, where he excelled in three sports: track, football, and basketball. In track & field, he competed in relays and high jump. He ranked 8th in the high jump with a leap of 1.74 meters at the 2009 Division 3-4A Meet. In the relay, he recorded a personal-best time of 1:32.63 minutes in the 4 × 200m relay and 44.32 seconds in the 4 × 100m relay as well, earning him lots of admiration and praises from critics. After completing his high school education, Cox began to receive scholarship offers from different Alabama Crimson Tide football of the University of Alabama, Ole Miss Rebels football of the University of Mississippi, Auburn Tigers football from Auburn University, and Tigers football of Louisiana State University. He finally settled for the University of Mississipi, where he played three seasons. As his junior, Fletcher totaled 103 total tackles (including 2 interceptions, 11 quarterback sacks) and had 104 total tackles (including a fumble recovery, 10 quarterback sacks, and one interception) as a senior. His laudable on-field performance at Mississippi led to his selection as part of the Mississippi-Alabama High School All-Star game. Through the years, Cox has grown to become a matured in the game of football. Initially, his mother never wanted him to play football. She loved basketball and hoped his son would carve a niche for himself in the sport someday but Cox’s love for football eventually overshadowed her desires. Football only became part of Fletcher’s life at the age of 13. Under the guidance of great head coaches such as Tony Woolfolk, the defensive tackle was able to grow his game through the years. Today, he stands out as one of Mississippi’s football greats and the NFL’s most respected defensive lineman. Fletcher Cox launched his professional career in the year 2012 when he was selected as 12th overall in the first round of the 2012 NFL Draft by the Philadelphia Eagles. In the same year, precisely on June 18, he went on to sign a four-year contract with the team. During his rookie year, he featured in 15 games and completed the season with 1 forced fumble, 5.5 sacks, 39 tackles, and passes defended. The No. 91 jersey man extended his contract with the Eagles on June 13, 2016, and is expected to spend the next six years with the team. The contract reportedly worths $103 million and came with a signing bonus‎ worth ‎$26,000,000 and $63 million guaranteed. Following an impressive performance in 2016, Fletcher Cox was unveiled as the 38th best player on the NFL Top 100 Players of 2017 as well as the 69th on the NFL Top 100 Players of 2018. He has also been selected to the Pro-Bowl thrice. Presently, his career awards and highlights include – First-team All-SEC (2011), Super Bowl champion (LII), 3× Pro Bowl (2015–2017), PFWA All-Rookie Team (2012), 3× Second-team All-Pro (2014, 2015, 2017), and First-team All-American (2011) while his NFL statistics as of Week 4, 2018 is detailed as follows: Total tackles: 295, Pass deflections: 11, Forced fumbles: 7, Sacks: 37.0, and Interceptions: 0. Salary – What’s His Worth? As of 2018, the 6 feet 4 inches Super Bowl champion earns a basic salary of $11,500,000 and an average salary‎ estimated to be ‎$17,100,000. The Eagles defensive tackle received a whopping $10.2 million during his first four seasons with the team, after which he signed a six-year contract worth $102,600,000 with the Eagles, as mentioned earlier. He ended the year 2017 with a net worth estimated to be $33.4 million. He practically built this figure from his winnings and salary, however, a small fraction of the figure is said to have come from his deals and endorsements. As long as marriage is concerned, Cox is yet to tie the knot. He is possibly single as there are records about him getting married to any woman in the past or now neither is he engaged to anybody. His love life has, however, been plagued by a ridiculous relationship scandal. In December 2017, he was sued for allegedly seducing and establishing a relationship with a married woman via text message. Joshua Jefferds claimed in his court documents that the footballer seduced and slept with his wife, Catherine Cuesta Jefferds. However, Cox insisted that his relationship with the woman thrived as a result of a mutual attraction between them and that Catherine willingly consented to it, adding that he was not even aware that she was married. The case was finally settled in August 2018, although the terms of the settlement were not revealed by the court.